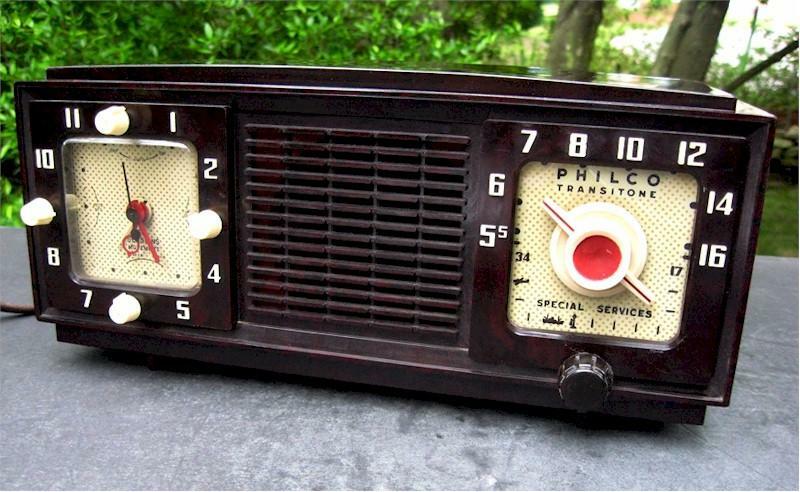 This is one of the great classic Retro style clock radios Philco made in the 1950's. Great marbling in the Bakelite case, and it has no damage, no cracks, no chips, no cosmetic issues. The original back is on the radio, and the label is on the bottom. The radio dial face lights up when the radio is turned on. All knobs are original. The radio has been checked by a professional and is playing well with no annoying filter hum, picking up all my local stations, and far away stations at night. The clock is working well, keeping excellent time. It's a two band radio, with the second band police & aviation back in 1953. About 12"W x 5"H x 6"D.
You are visitor number 2,291 to this page.